During my first year and a half of graduate studies I have learned a lot about what it means to be an academic professional. I am titling this blog The Adventures of a Busy Graduate Student and I want to share my experiences, good and bad, with current and future students. My name is Jamie M Gomez and I am second year Masters student in the College of Arts and Sciences and specifically within the department of Anthropology. I am a teaching assistant for ANTH 2500: Introduction to Biological Anthropology in which I teach two lab sections during the week. I am also the President of the Anthropology Graduate Collective (AGC) and the Graduate Ambassador for the College of Arts and Sciences: the Social Sciences. My Master’s thesis is comparing and contrasting skeletal growth patterns and timing among various primate groups using life-history theories. Being committed to so many activities is very time consuming but has forced me to have great time management, list making skills, and be a good multitasker. I hope to focus each blog post to a specific event or topic and that current and future students will find some helpful tips. I have been to several professional conferences presenting posters or just there for observation but last weekend, for the first time, I was able to present my work at the Bioarchaeology and Forensic Anthropology Association’s (BARFAA) annual conference in the form of a powerpoint presentation. I was extremely excited because this is the first time that I have created my own project (with the help of my awesome advisor Dr. Eng who currently is one of the features on the WMU homepage) and I was selected to present my work at the conference. Due to the fact that it was my first presentation of this sorts my advisor suggested that I present my work at WMU first before I went to the conference. Three other people in the department were also going to a different conference the same weekend and they found the idea of a trial run presentation great and we decided to hold a mini-conference within the Anthropology department before we all left. I can honestly say it was great and that it helped me prepare much better for the conference than I ever would have been before. I had always been taught that when giving presentations in class you should be prepared enough that you do not need notes or need only notecards but my advisor informed me that it is okay to have notes at professional conferences. This way you know exactly what you need to say for each slide, the right words to use, and to make sure that you stay within the time limit. As I went up to present my work at BARFAA, I was very confident and knew I was more than prepared because of the advice I got from my advisor as well as other people that attended the mini-conference. My suggestion is to do a trial run before presenting at a conference, have notes, and trust yourself and what you know. It was a long trip to BARFAA, which took place at Southern Illinois University but I made the most out of it by stopping at the Cahokia Mounds on the way back. Attending the conference was extremely fun and informative but was only the first step. I wanted to apply for funding for my conference presentation, so I looked for funding opportunities within my department as well as from the Graduate College. Way before I even went to BARFAA I had discovered that I could apply for the Maher Conference Travel Grant from the Anthropology department and the Graduate Student Travel Grant (GSTG) from the Graduate College. Anytime you present at a conference you should apply for all available funding because you might only get one or none. I made sure to look over all for the information before I went so that I knew which type of receipts and things that I needed to keep track of while traveling. For example: I needed receipts from my conference registration fee and hotel expenses for the Maher grant. It is also important to make sure that you have the up-to date information about the grant that you are applying for before you leave and start the application process. I applied for the most recent GSTG deadline which was Friday November 2nd and this was the first deadline with the updated application process. Now you only have to submitted one PDF copy instead of multiple print copies. I knew and heard of a couple other graduate students who were also applying for the November 2nd deadline and did not know about the updated process and had printed out multiple copies of their application before they figured it out (those poor trees!). My suggestion is to know how to and what grants to apply for long before you actually leave for your conference. 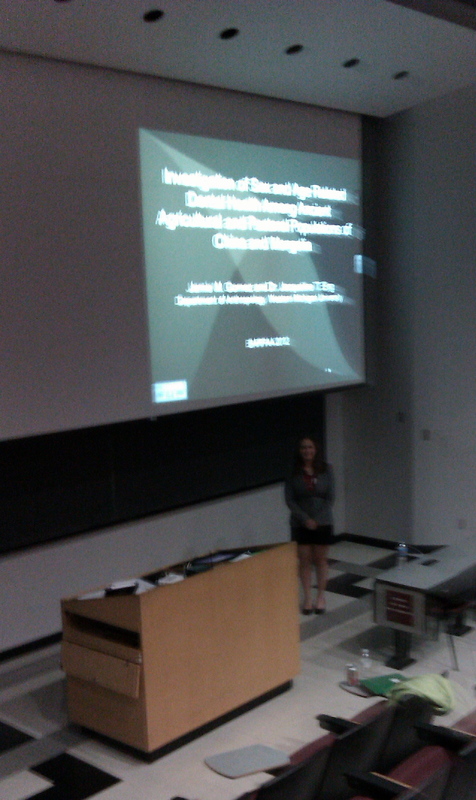 Attending an academic conference and presenting your own work is one of the best feelings that I have ever had. I was proud of myself and I feel that I represented my university and department as best as I could have. It makes me feel ever better that I able to apply for funding to cover all or some of my expenses. Whether or not I get the grants really does not matter as much as the experience and confidence that I gained and well as the networking that I accomplished. Glad to hear your presentation went well, and that you got a chance to visit Cahokia. I’ve heard it’s fascinating. 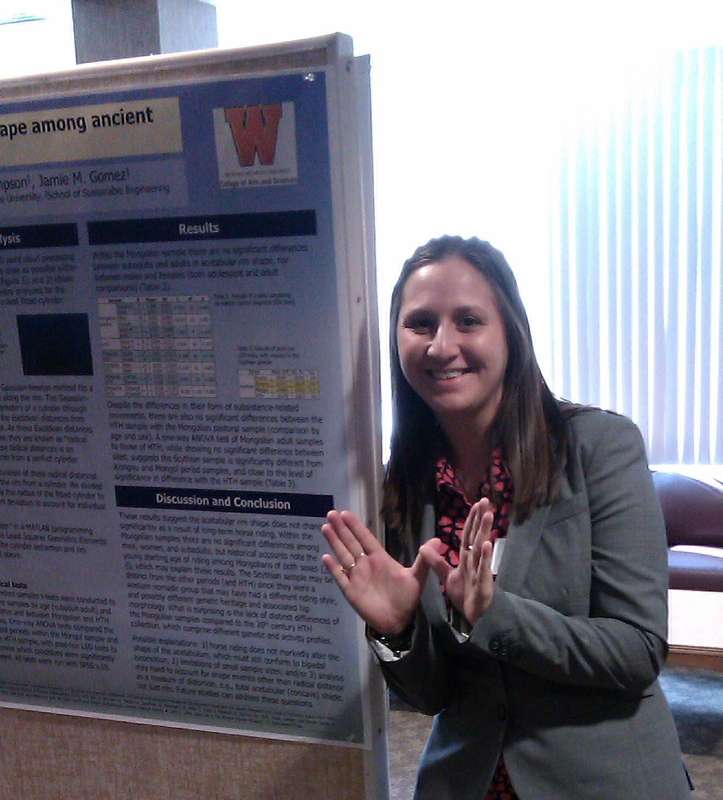 Congratulations on your presentation at the Bioarchaeology and Forensic Anthropology Association’s Conference.